When I started this blog I confessed that I was rather obsessed with collecting props for my food pictures and I have many a tale as to where and how I have come in possession of these cute beauties. Today I am going to share some of my new additions in the collection. The two little bowls with the intricate pattern on them were a gift from a friend who recently came over for lunch.She like others knows about my obsession for props and gifted me these cute bowls as thank you gift for cooking lunch for her.She tells me she got these in a Indian utensils store whilst shopping and immediately thought of me and promptly purchased them. I dearly love friends like this :). 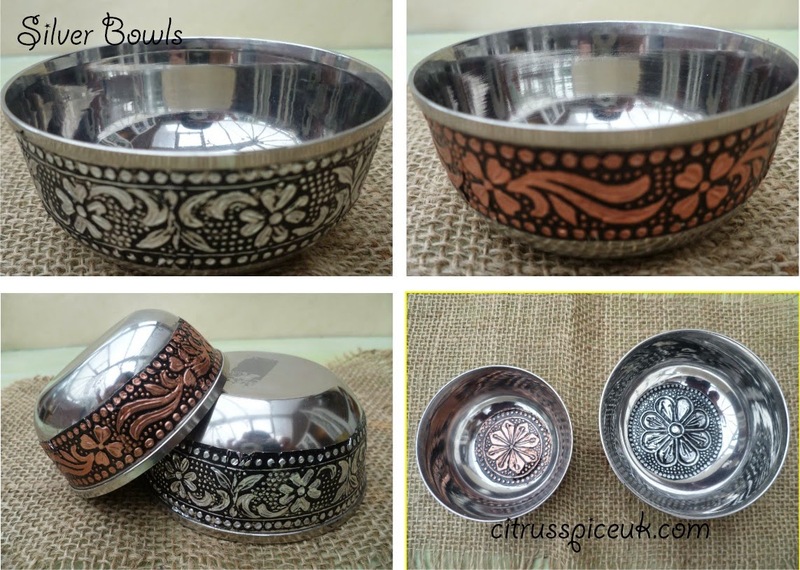 The bowls are silver in colour, the smaller one has a copper band with an intricate pattern inlay and the slightly larger bowl has a silver band with a similar intricate pattern around it. Both the bowls have an inner decorative pattern too and are really eye catching. 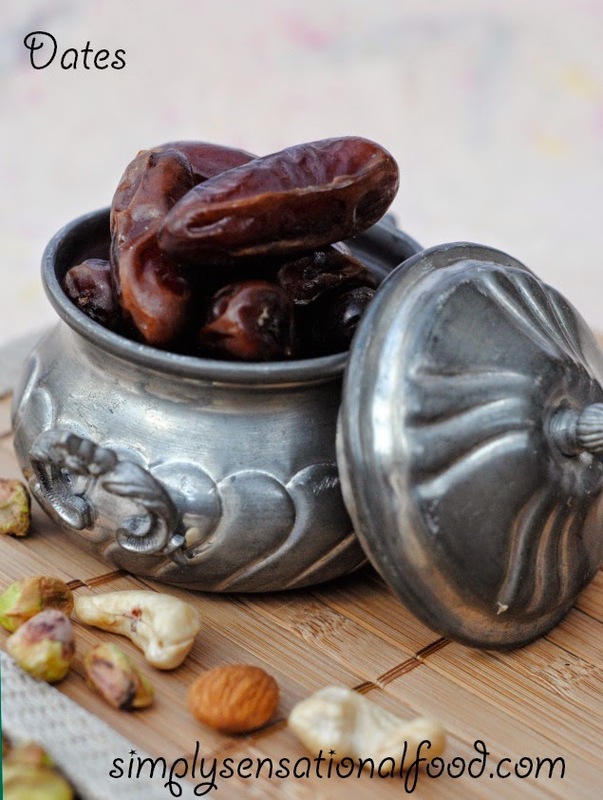 I have used the smaller pot with the copper band in my photo for the Date and Nut Barfi. The pewter pot featured in the picture above was a random find in charity shop, when I saw it I immediately fell in love the formation of it dome shape and the beautifully etched pattern around it. 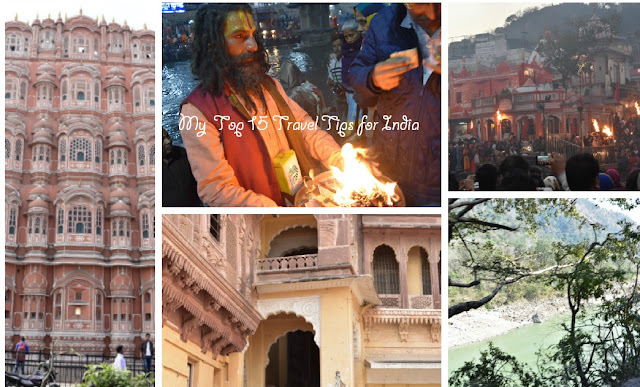 It reminds me of Aladdin's magic lamp or Eastern travels in exotic places. It was this visualisation of the East that inspired me to take this photo with the pot with the dates. 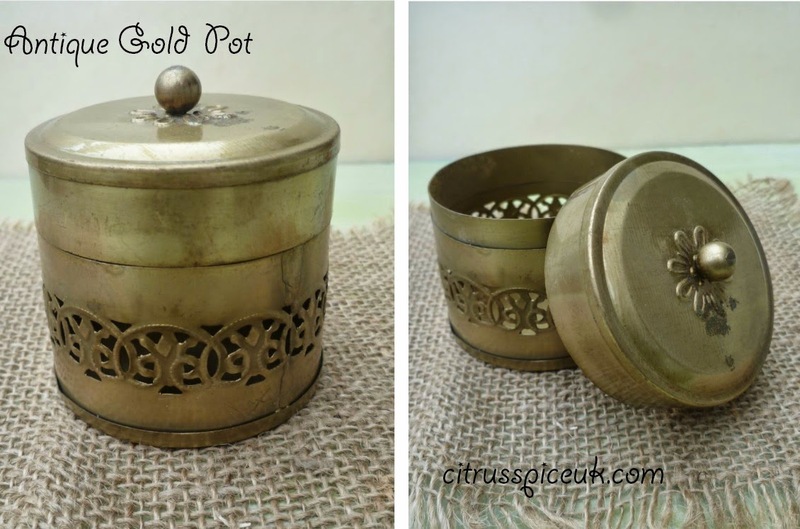 The antique gold pot featured below is another find from another charity shop. Sadly it is rather tarnished and does have a couple of dents in it but I think that adds to the charm of it. I am looking forward to featuring it in one of my recipe posts soon. The spoons, these were an impulse purchase from ebay, although when I purchased them the size looked a lot bigger in the picture but when I received them they were miniatures!!! 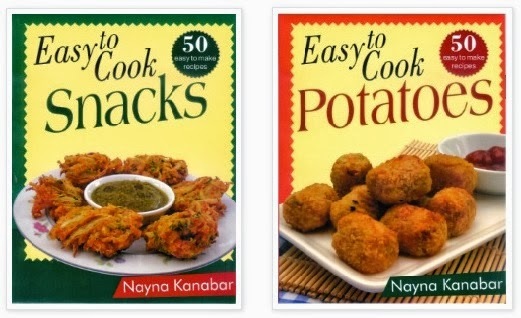 Despite their mini size I love them and they will look great with pictures of condiments or miniature ethnic desserts. They go really well with the bowls featured above. I love all of those pieces - so nice to have a beautiful selection of props for your food photos! Thanks for sharing. Pretty aren't they I love them too. Boo roo I am still learning how to incorporate in my photos and steadily improving. 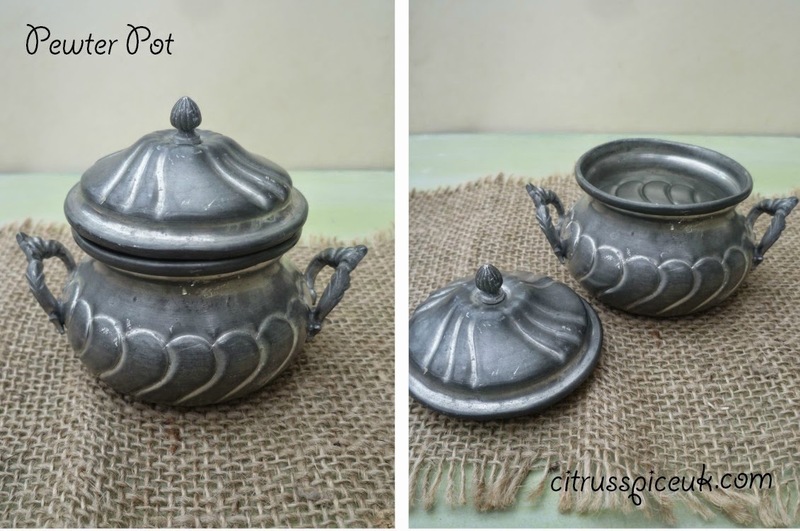 The pewter pot is gorgeous! Ebay plenty there but be warned they are small!!! With those kind of pictures you should be a food designer. 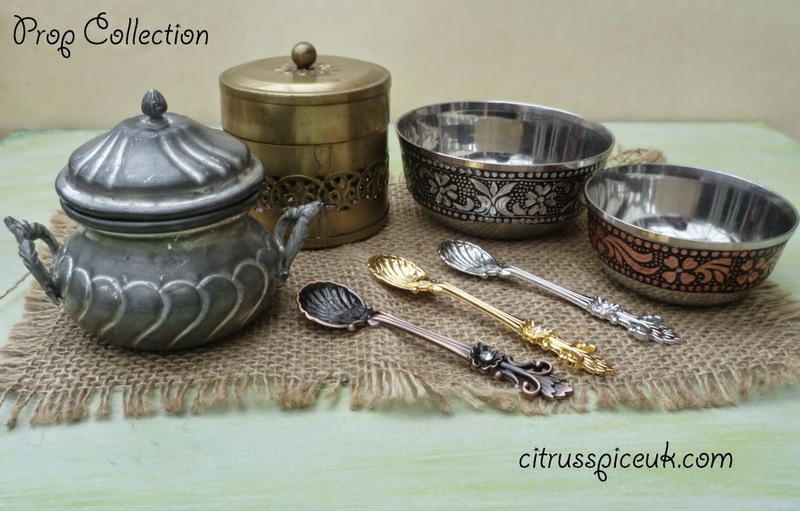 I love the pewter pots and great photos. Thank you so much for sharing your passion! Katrina what a lovely compliment but really I am just an amateur trying to click some good pictures. I love every single one of those items! Those spoons are adorable. You mentioned you collect pieces like this. Where do you keep them? I imagine you must have a lot. Beautiful pictures! I love silver, and the pieces you found just look fabulous. I love those. I really need to buy some more props. They look amazing! 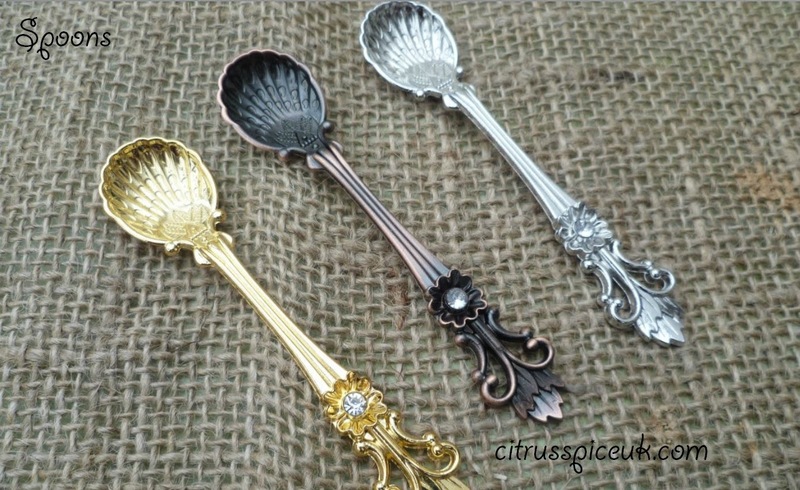 I love the spoons and I think they'll be even cuter as miniature, although annoying that it wasn't clear on ebay! Maybe I was at fault too didn't check the dimensions as I was in too much hurry to order them. They are lovely, so different. They really add that something special to your photos. My gosh these are super pretty. I need to become friends with your friend. lol but you know it has a down side too, people come around and gift me their junk when clearing out their kitchens thinking I can use it for props I end up taking it to the dump!!! Those spoons look gorgeous as do the other bowls. You always manage to find those hidden gems lurking out there. Tina, I have been really lucky and I adore these little treasures. 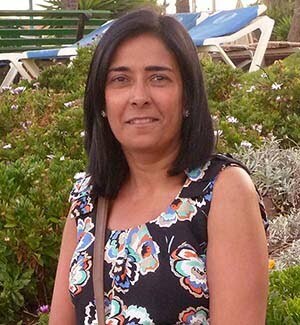 Tina I thought we were going to do a charity shop crawl one day!!! we definitely need to arrange something. Jen I think its a matter of luck really, being in the right place at the right time. These are gorgeous - you have captured them and the food in them beautifully. Looking forward to more of your recipes. Beautiful selection of props. I love the spoons they are so pretty. What fabulous little things. So pretty. You have a great eye for detail. What a pretty collection you have. I love them! 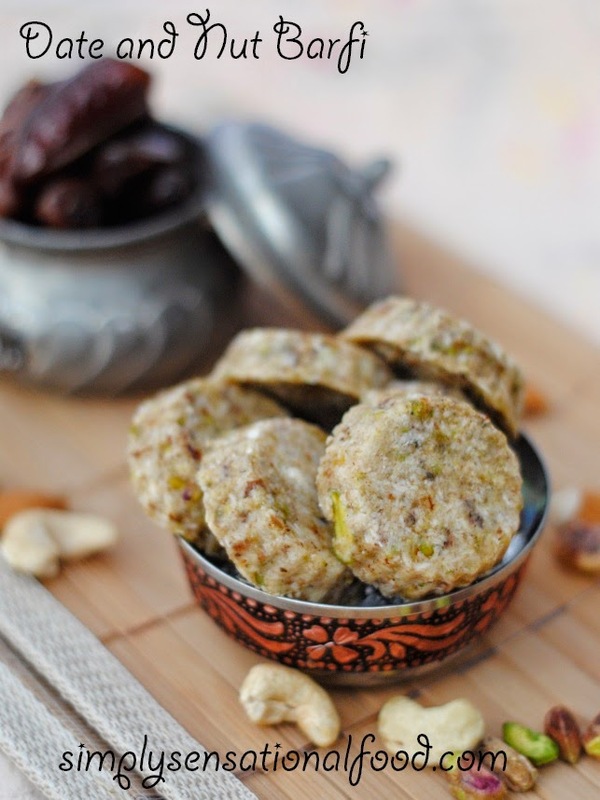 hi nayna, i luv the photo of the Date and Nut Barfi. it's so good, the photo and the barfi, of course. u should add a recipe on how to bake it. what a great hobby, collecting those lovely pots. the pewter pot looks like an antique, great props. imagine what u can find in an antique market! What great finds. I'm always scouring the local charity shops too for props. I haven't had as much luck as you recently! Sarah I have been really lucky. Hey Nayna, I am so jealous of you right now ! They are SO cute! What a sweet thing to post about :) I'd love to get myself some of these for my room, I love quirky stuff like this! These are beautiful and your photos are stunning.. I can imagine a meal or snack at your house would be something to savour! I really need to start collecting props for my photos! Beautiful pieces! I can't wait to see you use all of these pieces in future posts. I love the pots and your photos are lovely too. I rummage around in charity shops on a weekly basis - it is exciting to find something to use. Years ago I had a whole pewter tea set with tray. I could kick myself for having given it to a charity shop (where I originally found it) as I had no spce for it. Madeleine , OMG how bad is that , that's really disappointing. It's such fun collecting props. I have to keep a reign on my prop buying antics, as I don't have much storage space. So pretty, I love prop shopping, I did a little bit myself yesterday and found some lovely pewter plates! Lovely collection, lucky you to have some nice shops around you! I love charity shops and car boot sales if it comes to hunting for props! I love hunting in charity shops and at car boot sales. Over the years I have picked up lots of nice plates and bowls, including a couple of large serving platters that turned out to be worth many time what I paid for them. I find it helps if you stick to a colour scheme or type of material so that you don't randomly buy things that don't go with other items you already have. Nayna, you do have a gr8 collection of props and napkins.. 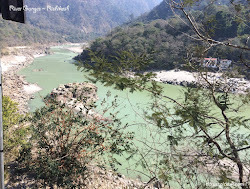 I have gone through a few posts where you have arranged them so neatly saving a lot of space.